Yesterday the housemates took part in nominations resulting in Chris, Pav and Zoe being nominated to face eviction. Therefore the housemates with the most nominations were Pav, Zoe and Chris. Wow, most of the old housemates must feel a lot closer to each other to just go with the 'easy' choice, even when they seem to be getting along with Zoe. Also props to Ash for not going with Chris after they put him up last week. No surprise from Mark, but Ash's choice of Christopher is odd. 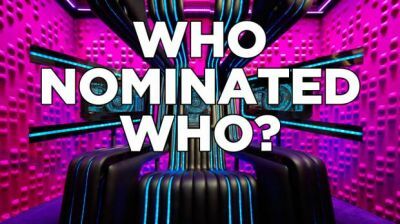 Zoe, Mark and Pav nominating Chris - shame on them. They can all just bog off now. Little surprised by helen voting zoe, wasn't she upset that zoe was up last week? Mark was never going to vote zoe after that dairy room rant about he got her all wrong, chris was picked because I have seen little interaction of him with mark on a one to one situations, chris probable doesn't like him and mark knows it. Why is Chris up for eviction??? "The 2 or more housemates with most nominations face the public vote"
If you total up the Chris and Christopher votes then its the same as Zoe got ... mistake? Matt's advice to Mark on the power Hms alliance task fell on deaf ears then. Matt told the three of them to stick together and Zoe was a snake in the grass...Mark then noms Chris and lets Zoe off. Must have been to please the public since he thinks she is popular ,not any more since "Tescogate"
What about that lovely Mark, nominating his fellow power housemate.. ...Lol..it was definitely on the cards though wasn't it! After all, he daren't nominate the ones that he really wants to!...Ashleigh [his other partner this week] because she got cheered by the crowd on friday,...Zoe who was the most popular on friday, and he see's as his passport to the minor-celebrity west end scene!...Or the one that he would really love to ditch now that he feels he doesn't need anymore...Christopher! ...can't wait to see his smug little face change when he realises that Christopher is way more popular with the viewers than him!